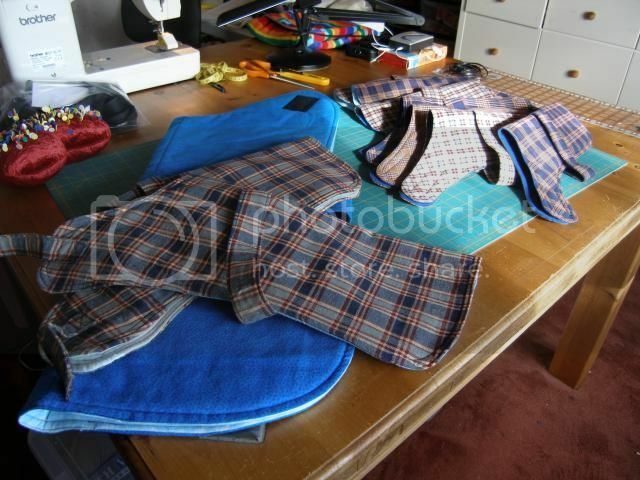 Having all kinds of trouble with the internet couldn't get into my journal send email or really get onto the internet at all so thought I would spend my time making some dog coats. I bought a couple of wax coats for my dogs, took a pattern for that and made to start with for my own dogs a flannel coat each for those dry cold days just to keep there back warm while out walking. Then my sister got a letter from Battersea dogs and cats home in London saying thank you for the dog coats and sweaters some of the knitters from our club had sent... I had knitted 6 but they take a long while to finish as I can't knit for long periods. Anyway they said they needed small coats as the winter was getting close, I had just made coats for my dogs which only took a day to make so I got stuck in. I made all out of double thickness flannel with some wadding in-between so they are nice and warm, 6 the same size I made for my dogs med size, and tried my hand at one small coat. All told in that box we sent them 47 warm winter sweaters and coats. 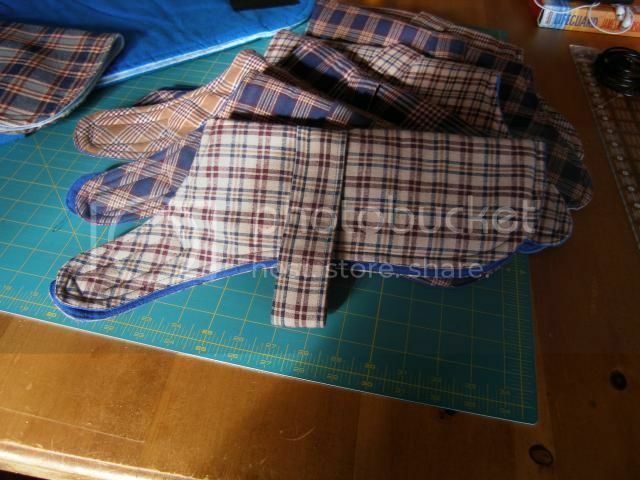 The photos here is of the next load we will be sending soon they loved the small flannel coat I made said they could use more so far I have 7 small, 2 med size, and one large that will fit a greyhound. Computer just crashed again so better get this posted. What a lovely idea - and so kind and thoughtful of you too. I bet Battersea will be over the moon when they see what you've done. They were pleased with the first batch we sent. It's good to have something to use some of my mountain of fabric on. They are so easy to make and I like to help if I can. Must say, though, I'm a wee bit surprised that they need small coats; the smaller dogs seem to find a new home faster than the big ones. My friend Jackie here lost her spaniel about a month ago, and searched all the rehoming places she could think of for a small dog, and couldn't get one - well, there was one, Suffolk way, but they wouldn't rehome from there to Scotland. She's ended up with a puppy from a breeder near Elgin - energy on four legs! They said they get allot of Chihuahua's Pug's and Jack Russell's so the need for the small coats plus they will take the coat with them when they get rehomed. Gives me something to do and a way to use up some of my mountain of fabric's. I can relate to the puppy energy, my two are now 9 months old still full of it, but they have settled in really well. So pleased we are through the house training stage, that was hard work. They still have a little chew on the rugs in the kitchen if left for too long I do remove my really expensive rug now as they chewed that one time, never again. But mostly they are really good. I had a dog door put into the conservatory glass door so they can go out when ever they want too that really helped with the training. My Bobbi tends to chew wires... We barricade off any wires when he's around. It is in part separation anxiety - he's a rescue dog, very badly treated before I got him, and even after eighteen months he still follows me if I move out of the living room, though he'll stay in the car without any problems. For a while I left him with Janet's dogs, for the company, if it wasn't a good idea to take him in the car (heat); I've begun to leave him in the house now for short spells, let him see I always come back. Today when we left to do a little shop we gave the dogs the run of the whole house but for my sewing room, pleased to say nothing was chewed. I'm pretty sure it was the shutting in the kitchen they were trying to get out even chewed the door frame it's not a small room by any means 23' by 16' so they had plenty of room was just the shut in I think.